We celebrated Calista’s second birthday today! 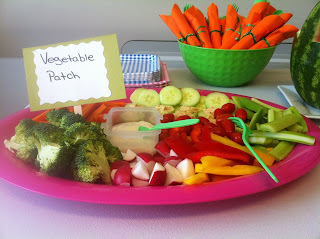 I love party planning and I’ll be honest, I’ve been brainstorming party ideas since well before her first birthday. My husband said that I’m not allowed to start planning her third birthday until two months before. Little does he know the power of ideas that flow from Pinterest! I chose to put together an On the Farm/Barnyard themed party. Calista enjoys making various animal noises and pointing out different animals. During a bike ride through Birds Hill Park, she was in awe when she saw horses up close. 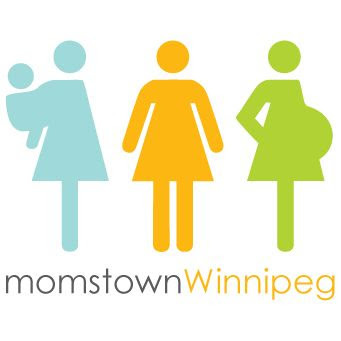 My childhood summers were also spent on my grandparents’ farm in Saskatchewan and I have very fond memories of being on a farm. All in all, it was the great theme to choose! 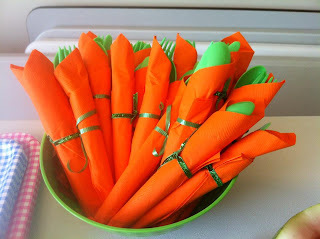 Napkins and cutlery were wrapped to look like carrots. 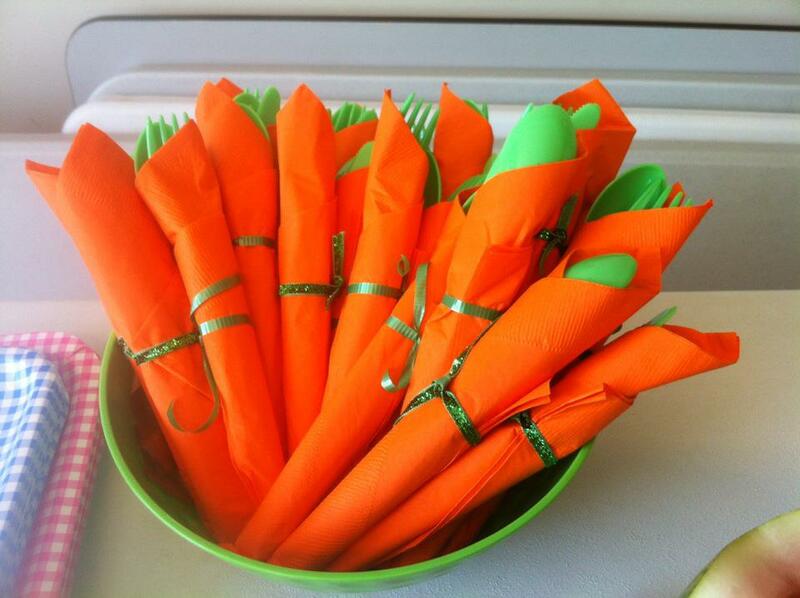 I wrapped orange napkins around green cutlery and secured it with green ribbon. 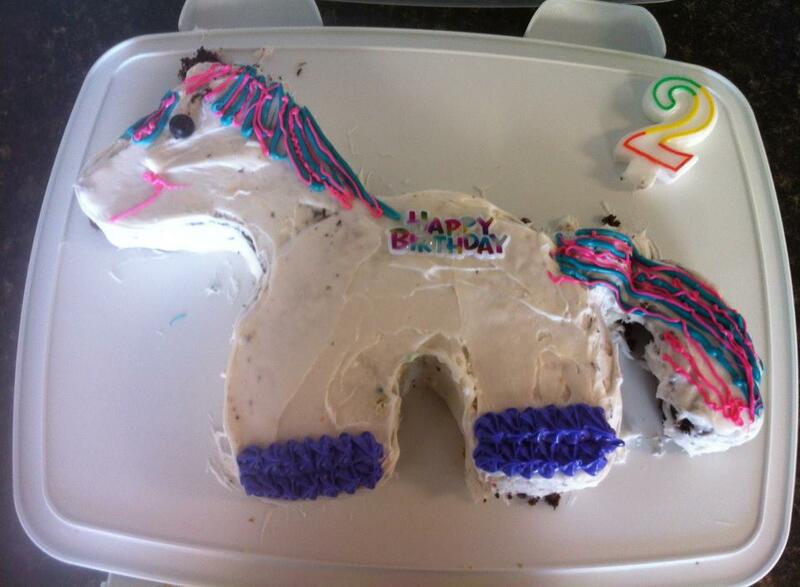 I found the pony cake on the Betty Crocker website and printed off the template to cut out the shapes. After the cake was baked and cooled, my husband helped me assemble and my mom and I decorated the cake. It was a bit of a rushed job since the assembly and decoration started about 40 minutes before people arrived (note to self for next year: allocate more time for cake decorating). 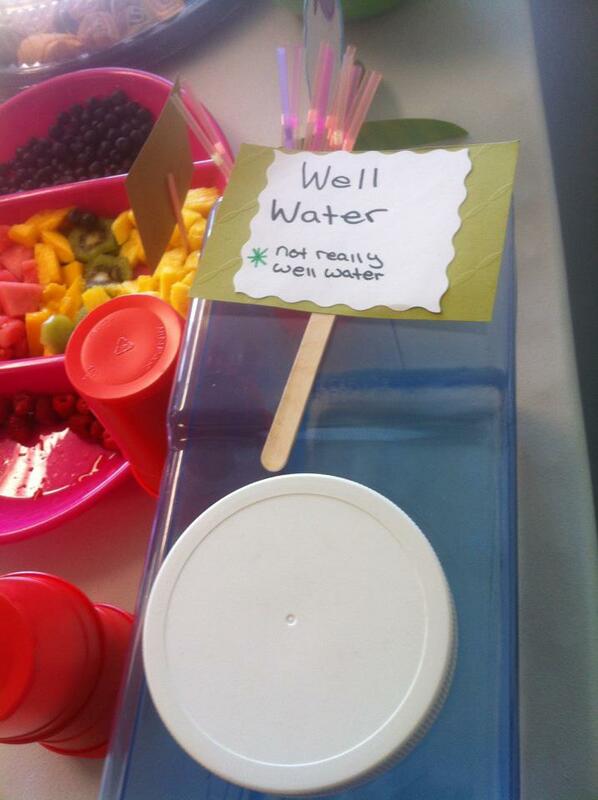 For beverages, I served Moo Juice (chocolate milk) and well water (not really well water). I made cute little signs with cardstock, markers and popsicle sticks describing things that are found on a farm. There was a vegetable patch, a fruit orchard, hay, and tractor wheels. Pretzels were used for the “hay” and wraps (because they are round) were the “tractor wheels”. 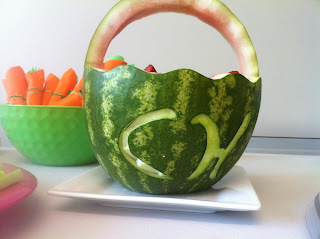 Baskets are found all over farms so it was fitting to carve one out of a watermelon and put the birthday girl’s initials on it. For decorations and invitations, we kept things very simple. I purchased barnyard themed invitations along with the matching decorations from the store, Party Stuff. The decorations contained 5 different cardboard cut-outs of various farm animals that I placed around the room in addition to the one balloon that came with the set. Easy peesy! As a thank you for coming to Calista’s party, I gave her little friends a book and stickers to do with “farms” that I purchased at Dollarama. The activities that I planned were very age appropriate for Calista and her buddies. We blew bubbles, sang Old McDonald Had a Farm and I read the story Barnyard Dance by Sandra Boynton. A fellow momstown momma gave me some cardboard cut-outs of barnyard animals that she used for one of her child’s birthdays. I glued popsicle sticks on to them and created props to go along with Old McDonald. I loved watching my husband use the props (his inner child has really come alive a lot more in the past two years!). 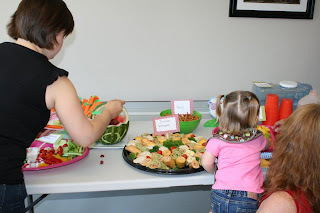 The party was two hours long starting at 11am which was a perfect time to do everything that I had envisioned and the kiddos were more than ready for nap time (mom and dad too!). The barnyard theme gave me a chance to be creative and to create some wonderful memories and pictures that I can look back on in the years to come. 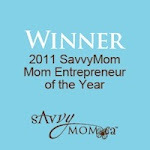 It was a wonderful party spent with loved ones! This article was written by our guest blogger Christina, who sure knows how to throw a party!